These pumpkins were fun to make and they incorporated a few new shapes and lots of matching practice for J. 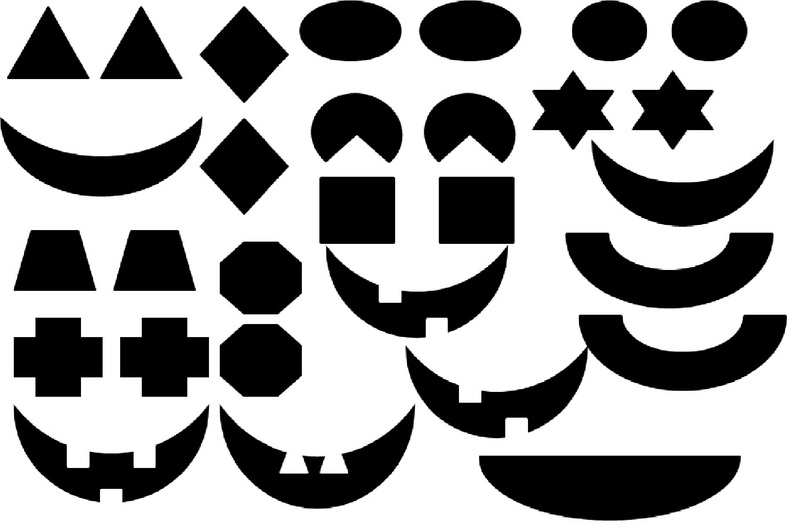 Prior to this activity, you need to have a selection of eyes (each pair a different shape), nose (shapes to match the eyes) and mouths cut out. **There aren’t noses on this example b/c I wasn’t intending to include noses at first. 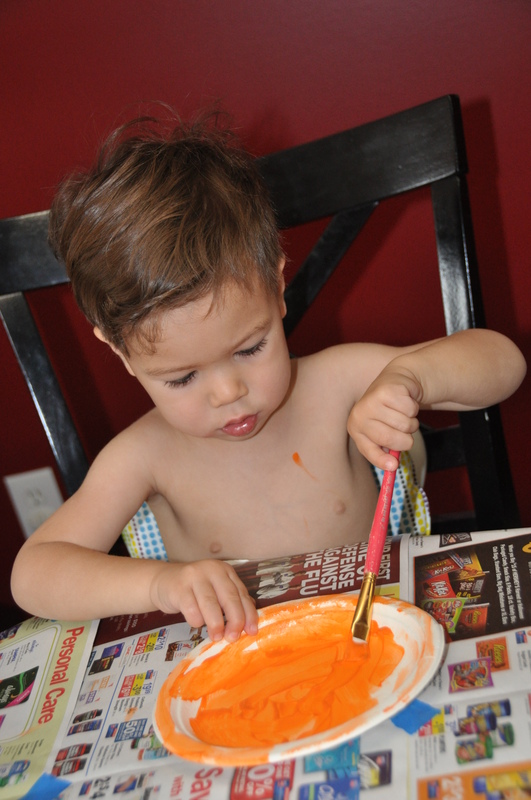 I first had J paint a bunch of plates orange with a small green stem at the top of each one. We made eight different plates so I did help paint some of them. I think he focused on 3 while I did the rest. 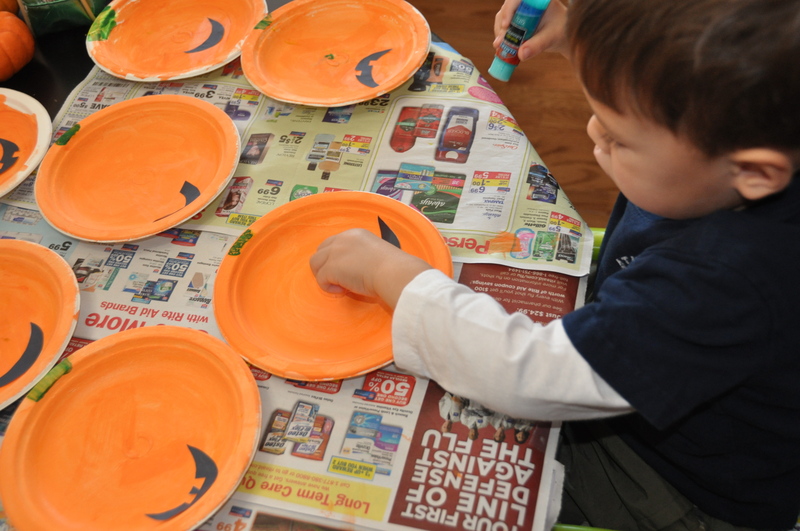 You could just print off some pumpkin clip art online instead of painting (but then you’d miss some of the fun!). The next day when the plates were dry, I set out the collection of mouths to choose from and J glued one m outh on each plate. We focused on location, the mouth is at the bottom of the face and he tried to glue in in the appropriate spot on each plate. I then set out the eye choices, mixing up all the different shapes and he had to match the shapes to create each pair of eyes. I was intending to stop here, thinking the activity was long enough already, but J insisted they needed noses. So I quickly prepped some noses and he matched them to the correct plate. 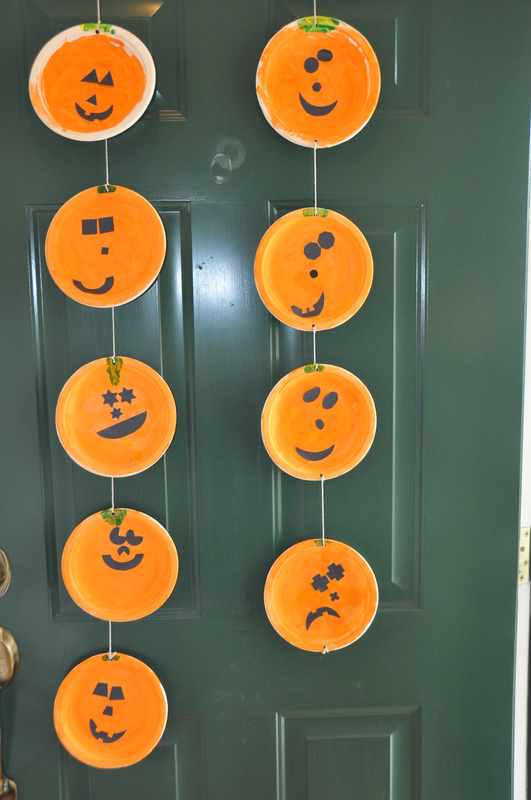 We strung the string through each plate and hung them on our door. J was quite proud! This entry was posted in Age Range, Arts and Crafts, Autumn, Early Preschool (3-4 years), Early Toddler (18-24 months), Halloween, Holidays and Seasons, Math, Preschool (4-5 years), Shapes, Subject, Toddler (2-3 years). Bookmark the permalink.